The review of systems for psychiatry has changed significantly over the years. Those changes were due to billing and coding decisions rather than clinical utility. If you have been practicing long enough you have witnessed the transformation from a document very similar to what primary care physicians use, to one that is more focused on the sleep and appetite disturbances associated with psychiatric disorders. That results in a distinctly different ROS in psychiatry than the rest of medicine. That puts medically based psychiatrists like myself at a disadvantage because the electronic health record (EHR) templates may not include the physical symptoms that I am most interested in and that requires more documentation. These changes are not unique to psychiatry. Patients find themselves filling out checklists in many clinics that are essentially a surrogate ROS. Something that your physician used to ask you in person and ask you to elaborate on is now a checklist. In the modern EHR, the ROS is often just a series of checkboxes. No elaboration required thank you. The form that you fill out in the waiting area is incorporated into the physician's note often without reviewing it with the patient. In some systems employing scribes or persons to do the documentation the scribe will type or dictate this form into the record. There is one additional point where the physician might read any ROS incorporated this way and that is during the read of the final note for signing. That review is usually cursory because of time constraints - I doubt it is read with any regularity. There is not enough time to read documentation 2 or 3 times as it is complied, transcribed, and entered into the EHR. Another EHR strategy that is used from time to time is a statement: "A complete 10-point review of systems was done and it was negative." Use of that statement depends on the billing, coding, and compliance staff and whether they think it meets the subjective standards of the day to demonstrate to somebody that the work was done. In my experience, unless you are interviewing a very healthy 20 or 30 year old it is unlikely that the ROS is completely negative. The expanded ROS is more specific to medicine and it assumes that the physician is asking clarificatory questions. I have found over the years that a very basic structured exercise like the ROS produces very different results depending on asking all of the questions, asking clarificatory questions, and pursuing obvious leads to other sets of questions depending on the patient response. Treating the ROS like it is a static series of yes or no questions is likely to produce the minimum amount of diagnostic information. The ROS is being conducted on a 75 year old man. He is being seen for insomnia. In taking the medical history he says he was diagnosed with congestive heart failure 2 years earlier. He has impaired physical performance due to CHF and can only walk 100 feet and slowly climb a flight of stairs with great effort. On the ROS he endorses needing to prop himself up to breathe and occasionally wakes up suddenly at night doe to shortness of breath. Those symptoms and additional physical exam findings suggest that CHF is the problem rather than insomnia and the treatment needs to change accordingly. The ROS is being conducted on a 50 year old man. He denies any cardiac or pulmonary symptoms and is only taking an 81 mg aspirin in addition to two different antidepressants. He has a 30 year history of smoking a pack a day of cigarettes. The interviewer asks: "Have you ever had stress test?" The patient states he does not know what that is. "You walk on a treadmill and they keep increasing the grade until you have to stop". The patient replies that he took the test and the Cardiologist came in and sprayed something into his mouth. "Do you think that was nitroglycerin spray?" The patient states that it was and he had an immediate angiography and stent placement. Both examples illustrate that the ROS is dynamic and not static. Filling it out in the waiting room may seem to be efficient, but the amount of information obtained in that setting is likely to be low relative to real medical problems that exist. The probability of increased information from a more dynamic ROS increases with the age of the patient due to accumulated medical problems with age. In addition to the list of symptoms in the ROS, additional heuristics at the level of pathological mechanisms can be considered to hone in on a specific syndrome. The following table illustrates two of them. 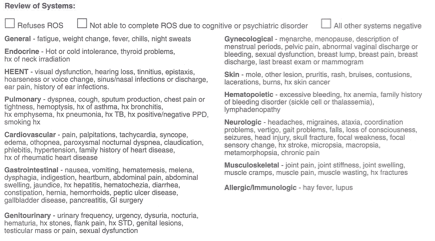 For example, the General category in the ROS generally implies some kind of infectious, metabolic or endocrine condition - but it is not enough to make an actual diagnosis without further delineation. ROS categories are supposed to roughly correlate with body systems rather than pathological mechanisms, but many of the symptoms do not have a definable body system. If I think the patient has a flu-like illness I ask about specific symptoms of flu-like illness. In addition to fatigue, weight change, fever, chills I might ask about - malaise, cough, rhinorrhea, nasal, congestion headache, sore throat, myalgias, chills, and sneezing. Positives on several of these symptoms greatly increases the likelihood of a diagnosis of a flu-like illness. Asking those questions occurs when an infectious etiology is suspected. The typical review of systems that I used for years is printed below with red highlights for additional points that I ask if there are any markers in the initial history that suggests that they might be positive. For example, if I am seeing a 50 year old with a long history of stimulant use, on three different antihypertensives and an anti-arrhythmic medication I will generally ask all of the cardiopulmonary symptoms and the additional questions about cardiac testing imaging and diagnoses. For example: "You mentioned that you have never had a heart attack or a stroke, but has any doctor every told you that you had cardiomyopathy or a thickened wall of the heart? Do you remember where all of that testing occurred?" These are techniques that I have found useful over the years. In psychiatry, the ROS is useful because I frequently have gotten past the medical history section and inquired about all major surgical and medical diagnoses from the past and the result is surprisingly thin. More specific prompting about the diagnoses and which physicians the patient has seen in the past can produce much more information in an interview setting. For psychiatric purposes, the ROS is also included in follow up visits and it seems necessary. I find it useful for documenting intercurrent illnesses and medical side effects. Each class of psychiatric medications has their own relevant ROS that can be recalled with practice. I might try to type those out at some point in time - but not tonight. My main point here is that the ROS does have a function above and beyond the psychiatric history for psychiatrists. People tend to view it as a difference necessary for one billing code or another. I see it as an opportunity to figure out what is really going on medically with my patient and possibly diagnose another illness. It is also necessary to know that the patient does not have an underlying medical condition or treatment for that condition that contraindicates or necessitates closer monitoring of the proposed psychiatric treatment.